BGASC Review: Insider's Take On BGASC. Learn More Today! Since the 2008 collapse of the U.S. housing market and its far-reaching economic effects, every type of investing has become cautionary. Consumers are a little afraid to let go of their money, but they want to try proven investment vehicles to turn their hard-earned dollars into something of higher value. That’s where investing in silver and gold comes into play because it’s time-tested. Precious metals hold their value over time, but their worth is sensitive to global financial markets. Investing in gold and silver is a good option for people with extra cash. One online market where gold and silver investors can turn is BGASC.com, which stands for Buying Gold and Silver Coins. We’ve reviewed this website below to help our readers make investing decisions. We immediately liked this site design for its simplicity. Buyers don’t have to waste much time looking around this gold and silver website for information before beginning to select products. Buyers will like the fact that there is no minimum amount for placing an order and that all orders over $250 get free shipping everyday. It’s easy to navigate around BGASC.com and locate different kinds of products. Choose from gold and silver bullion coins and bars, additional types of coins, and assorted items for storage and care of gold and silver items. 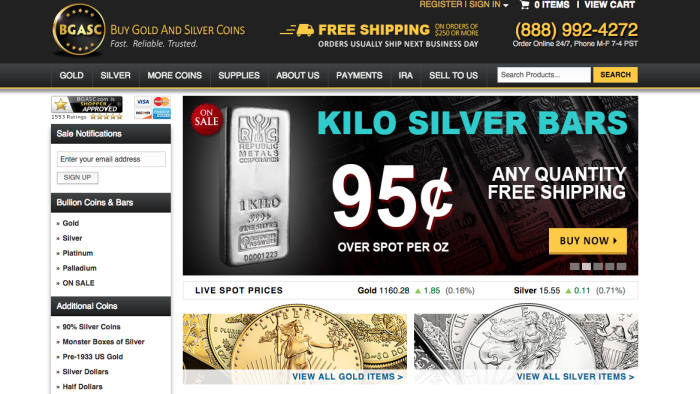 BGASC.com makes it easier to acquire bullion, gold and silver coins, monster boxes, and other products by frequently updating their Best Sellers and Featured Products sections on their front page. Silver.com has similar offerings to BGASC.com, but it groups its products according to gold, silver, platinum, copper, and grades. Customers can navigate these featured sections: Best Sellers, Popular Silver Products, Popular Gold Products, and New Arrivals. BGASC.com is family owned and operated and features an interesting video that highlights its brand called “Bullion Unboxing: Behind the Scenes.” See how exciting it is to open a package that BGASC.com has shipped containing your gold and silver items. Lloyds of London underwrites all of their shipments of gold and silver. BGASC.com is operated in California, but can no longer receive a rating from the Better Business Bureau because it sells gold and silver exclusively online. BGASC is a member of the Certified Coin Exchange (CCE), an Official PCGS Dealer, an NGC Collector’s Society Member, and a Bulk Purchaser of United States Mint non-bullion coins. It maintains a top-rated seller rating on eBay. BGASC.com operates strictly online. This company also belongs to the Certified Coin Exchange and is an authorized dealer for the Numismatic Guaranty Corporation. Potential investors will love how both BGASC.com offer customers the opportunity to read customer reviews and third-party reviews to see how their services stack up against other dealers of gold and silver.